Following the end of WWII, three groups took part in the translation and organization of captured Japanese documents (in cooperation with the Washington Document Center). 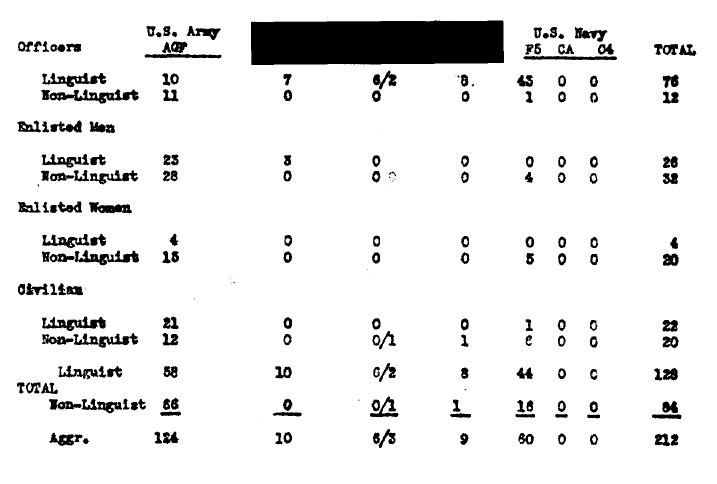 Most linguists and non-linguists were members of the U.S. Army’s Army Ground Forces (AGF); some were members of the U.S. Navy's ONI OP32-F5; and a small number were members of a third group (which I suspect was the CIG, the forerunner of the CIA). What was the name of that third group and who was in charge? I think you've stumped us at the National Archives! Yeah, I have a bad habit of doing that quite often. So I filed a FOIA request with the CIA and with the Office of Naval Intelligence to have all redactions of the that entire document removed. Why the CIA? Because it was declassified by the CIA in 2001. Great idea. Please keep us posted! I actually already filed my FOIA request with the CIA, who came back and said, "Why ask us? Ask Naval Intelligence." Then, while talking on the telephone with an experience FOIA officer with Naval Intelligence (on a different topic), I asked, "Why did the CIA reject my request?" She said, "They should have checked, and they should definitely have a copy of the non-redacted document since they were the ones who released it with redactions in 2001. But you probably asked in the wrong way. So I'll pass your FOIA request (with the Navy) on to the CIA; just worded properly." All I can say is, It's great knowing important people in high places. After a FOIA request with the U.S. Naval Intelligence, a very friendly FOIA officer, and a referral to an expert outside of FOIA, some -- but not all -- of my questions were answered. So I'll have to rely on an expert's opinion that the redacted Japanese linguists were from countries outside of the U.S. such as Britain, Canada, and Australia. Fascinating. Thanks very much for the update. I bet it helps someone down the way. When WWII ended, many tons of Japanese documents were seized. That number was narrowed down again and again until about 270,000 needed to be translated. If you look at the chart, about 100 linguists (few if any with training in the nuclear sciences) had to translate so many Japanese documents, many handwritten in Kanji, which was difficult enough to translate. So after two years, the translators had barely scratched the surface and many errors were made. In the end, hundreds of thousands of documents, which were seized by the Office of Naval Intelligence, and then the Central Intelligence Group (the forerunner of the CIA), eventually ended up at NARA, unclassified. 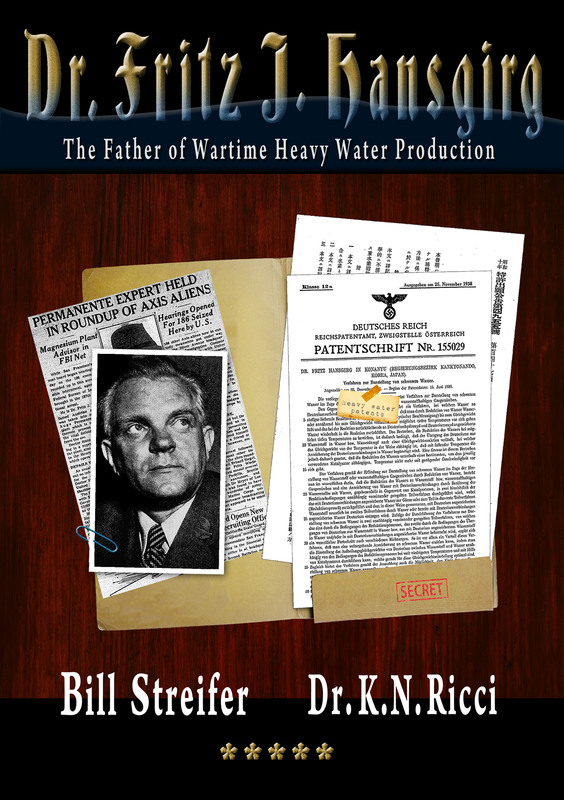 However, in 1946, President Truman requested that these documents should eventually be published for the benefit of science, and industry, and the military UNLESS they were classified. So about 30 of these 270,000 documents ended up being reclassified and isolated from the rest, at least one of which remained classified until 1998, or later. Several of those classified reports show that the Japanese advanced further along toward the development of the atomic bomb during WWII than most Americans (or experts) are aware, and most Japanese historians are willing to admit. This story, in far greater detail, required an entire chapter of my book to explain. But none of this would have been possible without the help of my co-author, an applied nuclear physicist from Stanford.... Thanks, Ken.